What needs changing? The shape of the ball? No. the laws of the game? Probably. The general attitude to women playing rugby? Certainly! Harlequins have been campaigning strongly for several months. Their chosen slogan: ‘The Game Changer’. With a similar campaign last year they attracted 4542 people to the Stoop to see them struggle to beat neighbours Richmond. 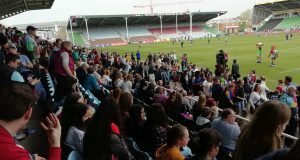 That attendance was higher than the then international record for the Stoop. This year they selected the very last round of the Tyrrells for the big push. 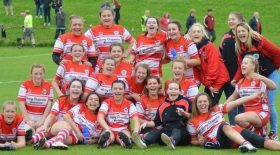 It was the most publicised club game in the history of Women’s rugby in England. And the crowds rolled up to set a new record of 4,837. The only thing missing was a tight contest. Gloucester-Hartpury (hereafter G-H) have been boxing above their weight for two seasons. They have highly talented players on their register, but where it counts, up front, they’ve struggled to match their strongest opponents. And so it proved today. They were unlucky with their injuries: we were denied the pleasure of seeing Kelly Smith matching up against Jess Breach; Zoe Aldcroft, their captain, has been missing most of the season; Georgia Brock was a late cry-off, and when Mo Hunt was an early casualty with a head injury from a tackle on Vickii Cornborough, you sensed the world was against them in the clamour of the Game Changer. She failed her HIA. G-H’s best chance of the first half came after a fine handling move down the right. They reached close to the line and managed to shove Quins’ pack back, but Jade Konkel controlled the ball and drove towards safety on the 22. The partisan crowd had to wait 13 minutes for the first score, and surprise, surprise, it came to Heather Cowell, bringing up her 20th try of the Tyrrells season. with an elusive run down the right touchline. From there Ellie Green coolly popped another conversion over. Cornborough drove through from a long way out to hoist the second try. 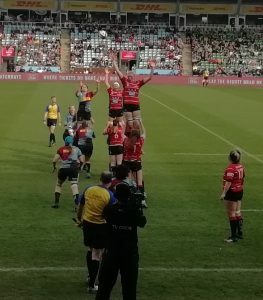 Green converted, but an attempted air-pass from her fell to Tatyana Heard; she flew to the Quins’ 5-metre line, but from there the G-H pack again showed their limitations. They had several bites at the cherry, but in the end the ball squirted out into the in-goal area. Two seconds later – well, actually it was 32 – Quins had scored at the other end! Emily Scott slalomed brilliantly to her 10-metre line; three long passes left and Breach could climb on her horse. Two defenders collided trying to stop her and the result was what we expect these days. The move was worth the entrance fee on its own. An outstanding offload by Abbie Scott let Leanne Riley hoist a searching kick to the right wing, but this time Cowell was dealt with. So sure were Quins of their scrummaging power that they didn’t bother with a penalty kick. They destroyed another G-H scrum, then – Green kicked the penalty. The second half took its allotted course. Sadly, Beth Randall suffered an arm injury that led to a lengthy delay and an end to her game. A searching punt by Green was reclaimed by Quins, they got over the line but were held up. Charlotte Faux earned a yellow in the process, so the next scrum meant an easy 7-pointer to follow. Rachael Burford sent the defence the wrong way with a feint, then fed Breach. G-H did outstandingly well to haul her in. They responded with some of the brisk handling that has brought them so many points this season. Khadidja Camara was yellowed for a high tackle; the visitors were briefly on the front foot. But it couldn’t last: Chloe Butler was on the end of another major Quins’ attack. The latter stages were marred by the reading of a law that needs immediate adjustment: the deliberate knock-on. First, Burford was decreed to have sinned when all she did was have the ball bounce forward off her as she held an opponent. An extraordinary decision. The referee promptly walked Quins back another 10 metres. Two minutes later, exactly the same situation: as Emily Scott attempted a pass, G-H’s tight-head, Katie Dougan, found the ball flying off her. She was dismissed. A quite baffling decision, completely contrary to common justice and common sense. The two alleged miscreants allowed themselves a mutual smile of disbelief as they sat side by side. Davinia Catlin finished off two moves as the Quins reserves overwhelmed the G-H scrum. Quins were running riot now. Deborah McCormack was the last to add her name to the scorecard. Quins deserve huge congratulations for the success of the day: a sumptuous 82-page programme, a maxi-sized flag, more flag-wavers than you can throw a stick at – how appropriate that they were wearing Barbarian colours – , and a non-stop PA chorus of COYQ! – fortissimo. Add to that, almost every girl below the age of 20 from SW London seemed to be in attendance. Achievement of the Day: the Valkyries’ second win on the trot and their first at home in the Tyrrells. A mile or two up the road from the Stoop Richmond, the second-oldest open club in Britain, enjoyed a crowd that hadn’t received the same kind of publicity. A few more miles north another famous club was infested by several swarms-worth of visitors as Wasps laid on a really big day of rugby and sundry entertainments for past and present players and families. They achieved the one other tightish result to build confidence before the play-off against Sarries. Bristol’s season finishes on a down beat: there is plenty of talent in the squad, but they haven’t been able to string wins together as they would have hoped. Loughborough proved too strong for Richmond, but when you have three players of the exalted status of Sarah Hunter, Katy Daley-Mclean and Emily Scarratt on your books, it’s almost a racing certainty. Even so, they didn’t run away with the game as Quins had done earlier. They will need to be at their best to hold off a Quins squad running into some serious form. 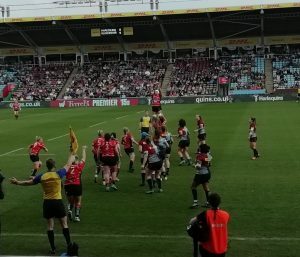 Sarries have suffered a blow in losing Vicky Fleetwood, Bryony Cleall and Marlie Packer for the duration. Right through the two seasons of the Tyrrells their back-up forces have proved too strong for everyone else. Wasps downed their colours last year, but would need the stars to align to repeat the achievement.